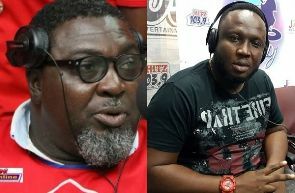 Legendary Ghanaian music producers, Hammer and Kaywa are expressing varying dissenting views on the issue of what makes song. The issue, which was first raised by rapper Sarkodie who stated that recording a hit song is an easy thing to do but it is not a sure guarantee that a successful musician will retire from music industry and live a comfortable life. Sarkodie who was speaking at the at the launch of the fifth All Africa Music Awards (AFRIMA) indicated that there is more to maintaining a reigning artiste’s status than just recording hit songs. He further explained that such an artiste also needs to build a large following, record timeless songs and build a lovable brand that will win the hearts of the die-hard fans any day. Disagreeing to claims by the 'Highest' rapper, Kaywa who is the CEO of Highly Spiritual Music said there are so many things to consider before one can get a hit song. He stated in an interview; “What goes into a hit song isn’t just being a popular artiste, it goes beyond that especially when you’re considering great records of our time, from the past to now, it hasn’t been dependent on the popularity of the artiste only but great production from the studio and even great videos can give you a hit song. Speaking on Hitz FM, Tuesday, the Music producer said the popularity of the song makes it a hit song. He said a hit song is relative. Hammer also noted that for an artiste to churn out hit songs isn’t dependent on having extensive knowledge. “Classic is the song that survives the test of time and not a hit song… a hit song is a hit song. What makes up a hit song is basically simplicity. Simplicity helps a song go all out. You do not need to have very great idea to come out with a hit song, a hit song is relative. A song like ‘Gamgam style’ has no content but it was just about the dance. You don’t need have too much knowledge to come out with a hit song. “But a classic is a classic so in Kaywa’s submission, what he meant was a classic not a hit song. In my submission the popularity of the song rather makes it a hit. Once majority of the people love it, it becomes a hit song.